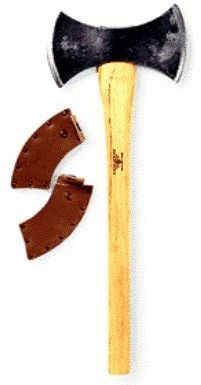 This double bit axe has a shorter handle for competition throwing. The axe has a great balanced feel and both bits are sharpened to a finely honed edge. The axe has a 6" faces and a 29" straight hickory handle, the head weighs 3 lb. Comes with 2 full-grain leather sheaths. On backorder at the moment. Expected shortly. Item: XG490 Price: $395 ea.